Bose Computer MusicMonitor review | What Hi-Fi? 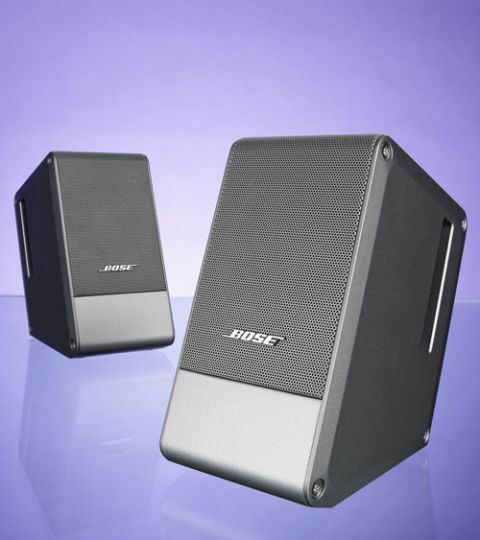 If something like the Epoz Aktimate Mini speakers are at one end of the desktop speaker size scale, then the Bose Computer MusicMonitor are at the opposite. Small enough to be portable should you wish, the Bose Computer MusicMonitor speakers measure in at just a little shorter than the Monitor Audio Airstream WS100 speakers, but are almost half the width, not to mention 700g lighter too. They’re still sturdy little units though, with brushed aluminium cabinets that give them the premium finish we’ve come to expect from Bose products. Their silver, minimalist design would certainly look right at home next to any Apple MacBook Pro or other top-end laptop, and there’s a good weight to them that gives the feeling you’re dealing with quality kit. The over-sized, minimally featured remote control does let this down, though: it feels like more could have been included here (or otherwised scaled down). It has just a power button and volume controls – even a mute button appears to be overlooked. If you’re close by, these controls are also featured on the cabinet of the master speaker (the right-hand one). Of course, they have a suitably premium price as well. It feels expensive when you look at what else can be had for that money – there aren’t even any extras like Bluetooth – but then you do get the advantage of the compact dimensions. You might also assume that these little speakers are limited in their abilities because of their size. That’s partly true, but there’s a lot more talent here than we’d usually expect from speakers of this type. The MusicMonitors feature proprietary dual internal opposing passive radiators, which Bose says will cancel out the vibrations of one another with the aim of enhancing the bass. The result is a partial success. The bass is weightier than you’d expect, and certainly more than listenable without feeling the need for a subwoofer. However, it is lacking here compared with rivals such as the Ruark Audio MR1s – and for the money, we’d prefer a little more kick to the low end. Where they do impress is in the mid and high frequencies. There’s no harshness in the treble and the mid-range is crystal clear, allowing Beyoncé’s vocal in Jay Z’s Part II to step to the front of the mix and shine. However, overall the MusicMonitors feel dynamically squashed. There could be more detail too, and although it’s impressive for their size, the soundstage is significantly smaller than the best. These speakers will surprise you by going louder than you’d expect, and with little distortion, but there’s a lack of subtlety here. Ultimately working in their favour, though, is the excellent tuning from Bose, which gives them a balanced presentation that makes them an enjoyable listen without feeling like there’s anything drastically missing.You don’t feel inclined to sit and listen to album after album, but there’s a quality here that’s rare in speakers this small. They come at a price, of course, but if you’re looking for good-sounding speakers that will take up minimal desk space and can go wherever you go, you could do a lot worse than cough up the cash for these.